Independent tank storage provider Vopak is increasing and enhancing fuel capacity at the Vopak Terminal Durban in South Africa, an important site where activities encompass the import, export and distribution of petroleum products. 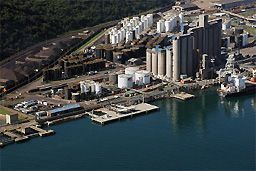 The upgrades at Vopak Terminal Durban incorporate Rotork IQ intelligent actuators and Pakscan digital control networks. The programme aims to expand and enhance Vopak's infrastructure to satisfy South Africa’s increasing demand for these products, improve the security of fuel supply and facilitate the import of cleaner fuels. The project will increase the site’s storage capacity from 177,735 to 234,200 cubic metres (cbm) by replacing a number of existing tanks with new state-of-theart storage tanks and installing new ancillary infrastructure including pipelines, pump bays and fire-fighting equipment. Undertaken in several stages, the programme also involves upgrades on existing tanks to achieve the highest safety standards and the replacement of manual equipment with automatic technology. Rotork CP compact pneumatic actuators operate triple offset butterfly valves in a back of berth application at Vopak Terminal Durban. Much of this work is being carried out by Engineering Process Control (EPC), Rotork’s long standing local agent in Kwazulu-Natal. In 2012,with assistance from Rotork’s South Africa facility, EPC began equipment specification discussions with Fluor, the Engineering Procurement and Construction Management (EPCM) consultant, regarding the planned upgrade projects. The first of these was a Tank Overfill Protection project, involving the automation of existing tank inlet and outlet valves, which was completed in 2014. 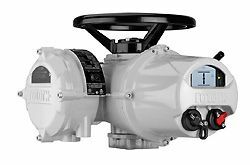 Here, 63 of the latest Rotork IQ intelligent electric multi-turn actuators were installed on gate valves and nine of the latest Rotork IQT intelligent part-turn actuators were installed on triple offset butterfly and ball valves. The work performed by EPC included the design and fabrication of new valve top work adaptation and commissioning of the actuators. These actuators are monitored and controlled by a single Rotork Pakscan Master Station and two wire digital network, providing open/close valve control and remote position feedback, linked to a Yokogawa Distributed Control System (DCS). Designed specifically for the valve actuation environment, Pakscan incorporates secure field communications with inbuilt network redundancy to maintain control even in the event of equipment or cable failure. Separately wired Emergency Shutdown (ESD) control is connected to the tanks’ high level switches and alarms. The Tank Overfill Protection project also included the automation of existing butterfly valves on the site’s drainage system. These valves were equipped with Rotork IQ actuators and quarter turnIW worm gearboxes in a scheme designed to eliminate the risk of any spillage within the bunds from accidentally draining into the outside environment. The next upgrade, known as the Fuel 2 project, began in 2014. The work involved the demolition of some old, small chemical storage tanks and their replacement with larger diesel and unleaded petrol storage tanks. These tanks are connected to the recently constructed Transnet New Multi Products Pipeline which runs from Durban to Johannesburg to meet the burgeoning demand for imported refined petroleum products.Connection to the pipeline is provided by a large new manifold and pump bay. As with the Tank Overfill Protection project, the valves in all critical areas of the Fuel 2 project are automated with Rotork actuators and controlled by Pakscan two-wire networks linked to a Yokogawa DCS. 30 Rotork Skilmatic electro hydraulic fail-safe actuators operate triple offset butterfly valves on the tanks’ inlet and outlet valves. These actuators are equipped with hardwired ESD circuitry which will override the Pakscan control and close the valves in the event of an emergency. Flow control on the new manifold and pump bay is provided by 33 IQ actuated double block and bleed plug valves,whilst an additional two electro-hydraulic actuators operate ball valve on the pipeline pig launcher. Four Pakscan Hot-Standby Master Stations control four individual loop networks on the two upgrade projects. In the field, a total of 164 Pakboxes have also been installed to isolate individual actuators from mains power and the Pakscan network during partial shutdowns if maintenance is required. In these events the Pakboxes maintain the integrity of the Pakscan4 Keeping the World Flowing network for the operation of the other field units on the same loop. The specialised design of the Rotork Skilmatic electro-hydraulic actuator delivers the swift fail-safe operation demanded by ESD duties. In the final part of the Fuel 2 project, EPC installed 14 Rotork CP compact pneumatic actuators on triple offset butterfly valves for a back of berth application. EPC has its own Engineering and Installation (E&I) division which has fulfilled the construction scope of the Fuel 2 project, facilitating good communications and successful commissioning of all of the Rotork equipment. In 2015 EPC began to work with Vopak’s new EPCM consultant Kanty & Templar on the Fuel 3 project, involving the partial demolition of two plant areas to provide the space for a rebuilt dedicated road loading facility and additional storage for unleaded petrol and diesel. Once again, EPC has supplied, installed and commissioned all of the Rotork equipment and its E&I division has fulfilled part of the construction. The upgrades at the Vopak Terminal Durban utilise Rotork electric valve actuation technologies for automated flow control and vital safety related duties associated with the import, export and storage of a varied range of liquid bulk products. The actuators incorporate ATEX explosionproof certification and IP68 double sealed watertight enclosures designed for harsh and exposed environments. They are monitored and controlled on fully redundant Rotork Pakscan digital bus loops, linked to the plant’s DCS by Pakscan Master Stations. In addition to IQ and IQT intelligent actuators providing reliable routine flow control, Skilmatic self-contained electro hydraulic actuators are strategically installed on tank inlet and outlet valves to provide fail-safe ESD protection from potential spillages and to isolate individual tanks in the event of a potential emergency. The specialised design of the Skilmatic actuator has proved that the performance required to achieve the swift fail-safe operation demanded by ESD duty can be successfully delivered through the electro-hydraulic route. Skilmatic actuators use a simple, very reliable mechanical spring to provide fail-safe valve movement, whilst precise and quick valve movement in the opposite direction is achieved hydraulically by means of an integral electrically powered pump. With this design, reliable fail-safe performance can be combined with the benefits of Rotork IQ intelligent electric actuation technologies, facilitating a high level of asset management encompassing accurate control, monitoring and alarm signalling, operational datalogging and diagnostics. Savings in capital and maintenance costs can also be achieved by the simplification of the overall plant control system facilitated by an all-electric solution. All the actuators share Rotork’s IQ non-intrusive setting, commissioning and data communication technologies. A hand held, intrinsically safe, Rotork Bluetooth setting tool enables swift and secure commissioning by means of easy to follow 'point and shoot’ menus. The same setting tool also enables actuator configuration and datalogger files to be transferred from the field to the office for diagnostics, analysis and storage. IQ intelligent actuator technology is capable of providing a proliferation of data, recording activity including the number of valve operations, alarms, valve torque profiles, unauthorised operation attempts and many other events. In combination with Rotork IQ-Insight2 software, this data can help to maximise plant utilisation by identifying potential problems and facilitating efficient asset management. The incorporation of IQ technology into the Skilmatic actuator introduces the same high level of control and monitoring functionality. Settings such as position limits, control options, alarm and indication functions can be accessed and adjusted. As with the IQ, actuator status, controland alarm icons are viewable on an illuminated display which also provides access to real-time information including diagnostics and help screens. The Skilmatic control module enables demanding operator requirements to be met, including compatibility with the Pakscan digital network control system. Certified to the requirements of IEC61508-2:2010 for use in safety systems performing safety functions up to SIL2 and SIL3, Skilmatic actuators are also capable of partial stroke testing, enabling valves to be tested without interrupting the routine process. This is of particular importance to minimise process shut downs when testing safety critical valves. All key components within the actuator including the hydraulic pressure and movementare tested to confirm availability for shutdown on demand. The test can be initiated either remotely or locally with the setting tool. The partial stroke position against stroke time is measured and compared to the original position to stroke time recorded at the commissioning stage. A pass or fail is displayed and, if enabled, a failure alarm will be activated. The alarm is one of three that can be configured to customer specific alarm and status requirements or for general group alarms. A monitor relay is also provided to monitor the power supply and any hardware errors. Skilmatic actuators are equipped with integral circuitry designed to receive a separately hardwired discrete ESD alarm signal that will override any other input and move the actuator to the pre-determined safe position, even in the event of electrical power failure. The ESD signalcan be configured to control the shutdown through a hardwired circuit by-passing the internal processor. This processor circuit monitors the position and internal hydraulic pressure and provides alarm monitoring but the ESD circuit is independent, thereby providing priority to an ESD command. In the ESD scenario the actuator will immediately return to the predetermined safeposition and will be ready to operate on the next command when the ESD signal is reinstated. As an added safeguard, an optional ESD manual reset can be enabled to restrict the actuator from operating until locally reset at the actuator or with an externally mounted switch. Closing speeds can be adjusted to meet the specific requirements of the application. 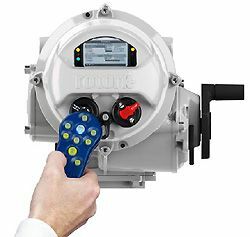 IQ, IQT and Skilmatic actuators share Rotork’s non-intrusive setting, commissioning and data communication technologies.